Check out this very nice HISTORIC "Golden Age" 1941 Super Hero page, which was penciled by the great Pierce Rice, and inked by the great Arthur Cazeneuve, from the story titled: "The Sinister Saboteurs!" 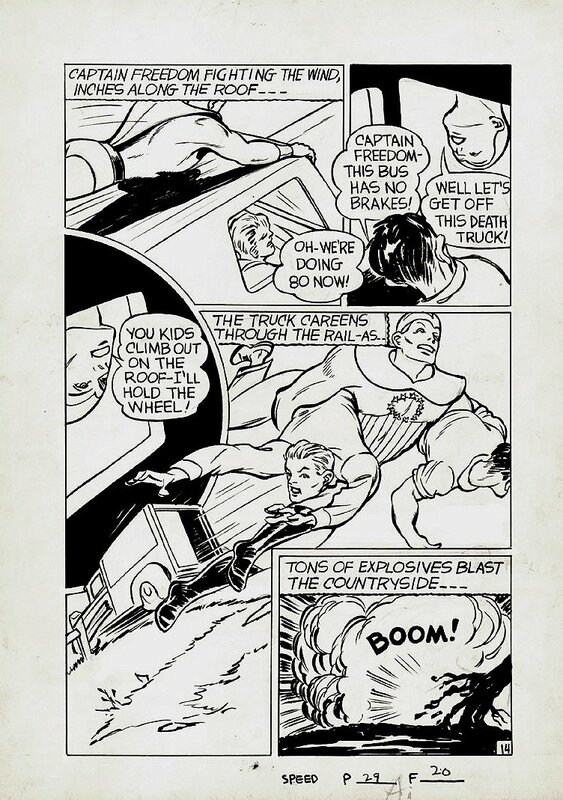 This nice page features Captain Freedom in a VERY large semi-Splash scene as he saves the kids in the story! 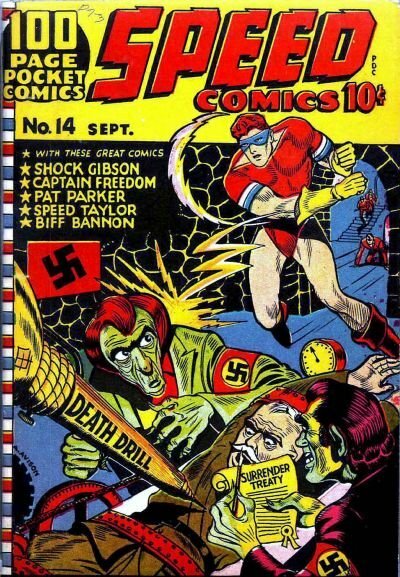 Captain Freedom first appeared in a short 4 page story in Speed comics 13, and this page right here is from the VERY FIRST full Captain Freedom story! With this issue being from the POCKET COMICS, the art was drawn smaller on an 11 by 15 inch art board, with an 8.25 by 12.5 inch drawn art area. A great opportunity here to own this HISTORIC "HARVEY" version of Captain America, which came out the same month as Captain America Comics #6! ALL art on our website (including this one) are able to be purchased with VERY fair time payments, and trades are always considered towards "ANY" art on our website! Just send us an email to mikeburkey@aol.com and we can try to work something out.